Victoria Square, Tarndanyangga, Sat 23 Mar. Carmen is possibly one of the best known operas performed on the modern stage, but even if you are unfamiliar with the storyline, the music is often far-reaching in the community with songs such as The Habanera and Toreador Song! Being one of my favourite operas, I was super excited to attend, although a little sceptical of how the acoustics would pan out in such an open area. My concerns were soon put to rest; it was such a treat to hear and watch another magnificent performance from State Opera of South Australia and Adelaide Symphony Orchestra. The low hum of expectation from the crowd with their picnic blankets spread out on the grounds or the seated patrons with string lights above them created a delightful atmosphere; I loved seeing young and old together enjoying Carmen for the fourth or first time – all of them delighted to be a part of this perfect evening under the stars and scattered clouds. A pre-show entertainment of flamenco dancers put us in the Spanish frame of mind, getting us ready for the main event. And, of course, our Welcome To Country from Jack (Vincent) Buckskin, his stories and welcome is heartfelt and lovely. The lights dim, the stage is bare, no scenery to speak of, just a bit of scaffolding, tables here and there for some scenes, but the simpleness allowed for more attention on the performances. The orchestra in full view at front of stage allowed us to watch the animated Oliver von Dohnányi conduct the ensemble; it was just as entrancing as watching the production unfold behind them. Helen Sherman seamlessly portrays Carmen as the vivacious gypsy playing by her own rules in life and love, and James Egglestone is fabulous as Don José, the hapless victim of Carmen’s spell. Their tale of love, jealousy, betrayal and murder comes to life with the amazing support of the rest of the cast and chorus. 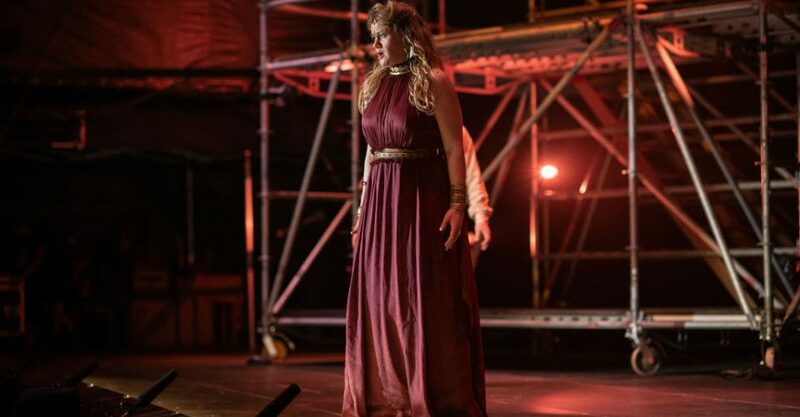 Other stand out performances include Morgan Pearse as the powerful bullfighting and charismatic love rival for Carmen’s affections, and Emma Pearson as the caring Micaela who tries in vain to save Don José from Carmen and from himself. Although I know the story of Carmen very well, I was still chewing my nails hoping for a different conclusion. With its confronting and shocking ending, it brings about the discussion of domestic violence and there it is, right in front of stage, the worst possible outcome for any relationship. The thought process is in motion for a lot of the people at the end of the show who questioned how it could have ended differently. Of course it wouldn’t be Carmen if it did, would it? 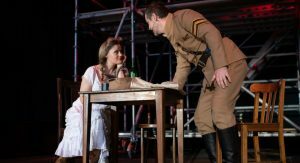 Overall, State Opera’s production of Carmen is a brilliant event to bring opera to the people in a casual outside venue. I hope it has instilled the love of opera into a new generation of theatre goers, and as I watch some young girls dancing along with the arias I am optimistic that it has.